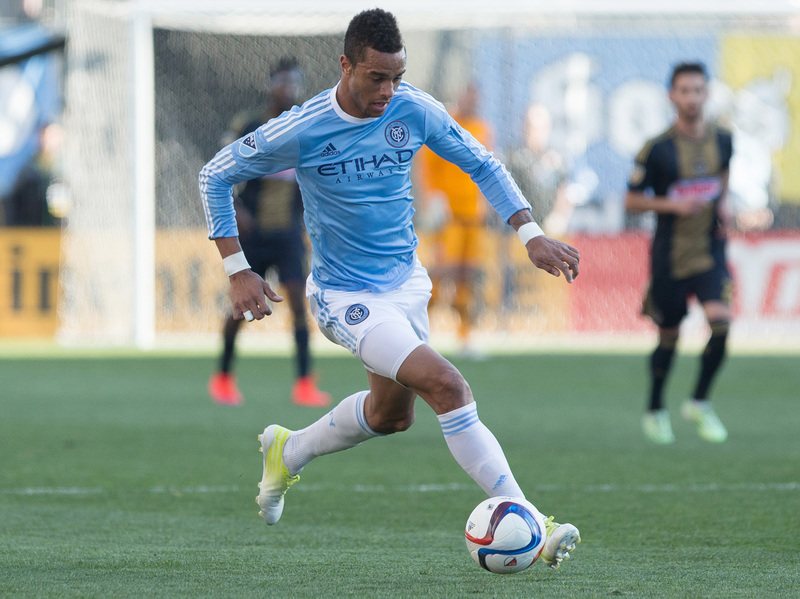 It’s been a pleasure to share an inaugural year with the New York City Football Club! We have watched you grow as a team and spent hours cheering you on, spreading the word, and yes, fantasizing about what you might all be like in the flesh. Until you let us into the locker room we’ll put our multi-sensory storytelling to work. Aroma and flavor have the great capacity to take you places. With the help of Nez Bar Co-founder, sommelier-in-chief at DiVino, we paired some of our favorite players with some of our favorite things, fragrance and cocktails. NYCFC Striker David Villa Sánchez may be 33, but he’s been referred to as El Guaje, ‘the kid’ in his native Asturian dialect for years, as he excelled early against players much older than he was A native of Asturias in Northwestern Spain, young David had a powerful start by age 18, and captured the eye of the Spanish national team by 2003. He thrilled spectators during the 2006 World Cup when he scored three goals after substituting in for the infamous and beloved Raúl, known by a single name and referred to at the time as the “world’s best striker.” In 2012 he scored his 45th goal and soon after became the first Spaniard to reach 50. Today, he still defends his title as Spain’s top scorer. Best known for his years with Barcelona and his international appearences with Spain’s La Roja, We love his energy and youthful vigor. He brings freshness and fire to NYCFC and we couldn’t imagine a more perfect pairing than a Cuvée de Prestige Reserva Real from historic Cava producer Freixenet. This golden boy took the UEFA Golden Boot in 2008, which makes him something of football royalty. Reserva Real is a Méthode Champenoise Cava produced in Alt Penedès, just outside of Barcelona. It blends the best of many years of production and was first released to commemorate a visit from Spain’s royal family. Shimmering gold in color with celebratory toasty notes it’s got verve on the palate and never tires. When David Villa rips off his jersey we imagine whiffs of Creed Aventus Eau de Parfum. Created with ingredients hand-selected by Olivier Creed and his son, it is regarded as Creed’s finest creation, a pure and masculine scent that evokes strength, power, vision and success. Tropical fruit notes glitter in an almost ageless top note while the heart and base are all strength and stamina. Perhaps the most exciting senior acquisition to NYCFC, Italy’s Andrea Pirlo strides across the field with the poise and precision of a lion king. His demeanor speaks volumes to his experience as a deep mid-fielder. Meditative and meticulous, he preys on the ball and leads an adoring pride. At just 16 he made his Serie A debut with Brescia. He was soon snatched up by AC Milan and later by Juventus until 2015. A three-time Serie A Player of the Year, he also led Italy to World Cup Victory in 2006 with an opening goal and stellar set-up against Ghana. He would later set-up teammate Gilardino’s header, which proved vital to Italy’s draw against Team USA. Not only does Pirlo observe and orchestrate with grace and skill, he scores goals of his own and is particularly coveted for his free kicks and penalty kicks. His list of honors and accomplishments is so impressive it nearly caused the hyperventilation of this author, who admittedly had to take a break to catch her breath midway through the composition of this piece. Andrea is known by fellow players and friends as maestro (the master), Mozart (for his virtuosity, and the metronome for his great sense of balance and ability to guide his team. He is the quintessential soccer player, displaying killer technique both individual and integral. It was no easy task pairing this one. We liked the idea of a Franciacorta, Italy’s most heralded appellation for sparkling wines and produced in the area surrounding none other than Pirlo’s birthplace of Brescia. But his maturity, profound approach to the game and refined technique pointed to Valpolicella. Specifically, Allegrini Palazzo della Torre IGT 2011. A wine of great character made in the ripasso technique. It involves a calculated encounter in which fresh wine is passed over semi-dried grapes used in the production of Amarone raisin wine, which bestows complexity and depth of flavor on the piquant red blend. Ripasso wines are unpretentious and clean. The secret to their success, a crucial passage. And what inebriating essences adorn the tresses of il leone? We imagine our maestro in an aura of Azzaro Pour Homme. First released in 1978, it’s an aromatic fougère that builds on a classic accord but is action-packed at the heart with deep and masculine notes of Vetiver, Sandalwood, Patchouli, Oakmoss and Cardamom, all atop an alluring ambergris and musky base. Intelligent exuberance meets come to daddy. London-born ‘Lamps’ is all about clean lines and good parentage. Our midfielder made waves for Chelsea during his long stint with 211 goals, following in the quick footsteps of his father, Frank Lampard Senior, a decorated footballer of his own ilk. Lampard is classic in style and a bit restrained compared to today’s concept of the raucous English footballer. He is considered by a number of journalists and football experts to be one of the best midfielders of his generation. A three-time Player of the Year winner for Chelsea, he is the team’s all-time top scorer. He’s played with England throughout several World Cups and took home FIFA’s Silver Award for World Player of the Year in 2005. When we raise a glass to Lamps, we certainly hope it’ll be filled with Newcastle Brown Ale. It’s a hardy ale of decided pedigree and a symbol the hard-working Englishman to the core. We imagine that up close and personal, this boy smells of Burberry Brit Rhythm. Juniper, basil and verbena entice initially, but this fragrance is all about a smooth and put-together leather trench coat. Can we come inside? 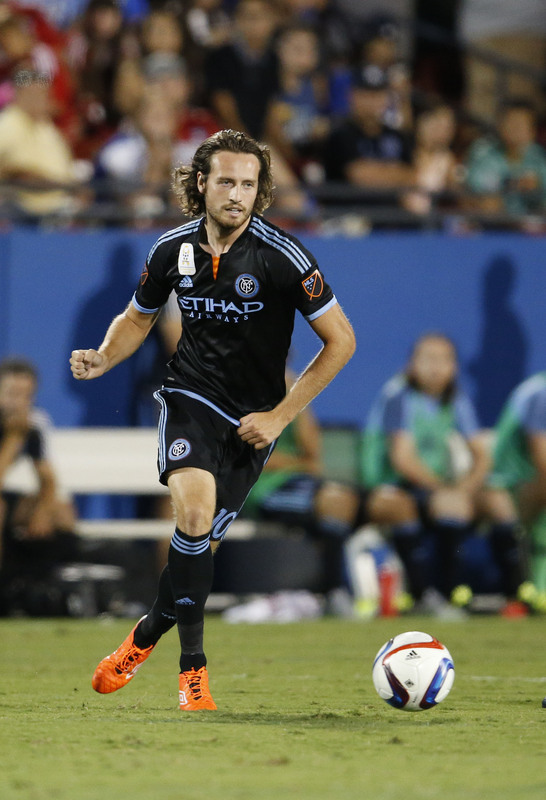 Mikkel Morgenstar Pålssønn “Mix” Diskerud, is the bright young buck who scored NYCFC’s first ever MLS goal in an inaugural match against Orlando City. He has continued to infuse the team with the verve and optimism of youth. Born in Oslo to a Norwegian father and an American mother who used to call him “her little mixmaster” when he tore around the house, Mix began his career abroad, playing with youth team Frigg Oslo and later Stabæk. He remained in Norway playing with national teams including Rosenborg with the exception of a brief loan to Belgian Pro League club K.A.A. Gent for the 2011-2012 season. Thanks to his duel citizenship, Mix moved to America and joined Team USA for World Cup 2014. Mix lives up to his namesake, dashing to and fro on the midfield, setting ‘em up and often putting them in. We’re excited to see him grow, which is why we’ve chosen to pair him with an American wine that shows better with time. Lieb Cellars Reserve Pinot Blanc 2014 is made from the winery’s oldest vines, which are older than he is. It is a beautiful example of an alpine variety (Pinot Blanc) that really blossoms on American soil. It’s vibrant and crisp with notes of green apple and lemongrass. Put it away and wait for the roots to emerge with a rich sea salty finish. While we’d have to get close enough to confirm it we like to speculate about Mix’s more sensual side. We came up with Marc Jacobs Bang Bang. It’s a dynamic and glittery up front with lots of playful citrus on top, but inside is a strong warm heart. He’s the one the crowds chant for right up to the end, so we figured we’d play the same game. 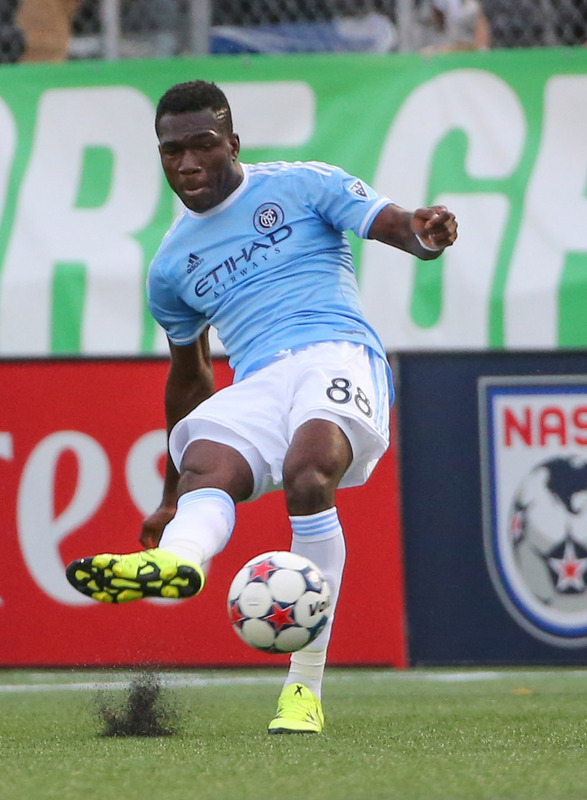 At only 23 years old, Poku has made a name for himself, mostly on US soil. Born in Kumasi, Ghana in 1992, Kwadwo, who goes by Poku these days, first trained with the youth division of his hometown team, Asante Kotoko SC, the most successful squad in the country. He than headed first to the Georgia Revolution as a striker and top scorer. In 2014 he joined the Atlanta Silverbacks, whose manager described him as one of the best players in the North American Soccer League. In 2015 he was signed by NYFC as a midfielder and quickly became a fan favorite for his eye-catching performances and his contagious energy. As much as we’d love a tall glass of Kwadwo, we’ll settle for Four Roses Small Batch, neat. No way to know of course, but we have a feeling his lucky lady wakes up still dreaming. To us, Poku exudes the absolutely edible A*Men Pure Havane by Thierry Mugler. It’s all sweet cherry, tobacco, cacao and vanilla spice.